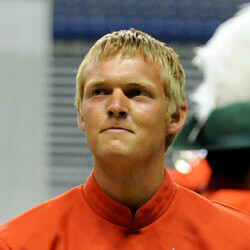 Matthew Geiger, 19 University of Kentucky Santa Clara Vanguard Front Ensemble, 2009 How did you choose your corps? It was the corps that I respected and looked up to the most. I can't imagine spending a summer with anyone other than Santa Clara. In your experience, what's the best way to prepare for an audition? Be very flexible, and be extremely comfortable with whatever you are asked to prepare. Talk to the staff members beforehand. That will give you the opportunity to ask questions and get an idea of what you are going to need to do for the audition. What can a prospective corps member expect when he/she shows up for an audition weekend? Expect to be pushed but in a positive manner. Things will not always be easy for a new member because the staff wants to know where they can take you, what they can do with you, and where you need to work toward to become a better member of the group. The first time you auditioned, was the process different from what you expected it to be? My first audition I felt like I was very prepared, but over the course of the weekend my style and technique was pushed to the limit. Although I was frustrated with myself because I wasn't perfect (in retrospect, nobody was), I was content that I learned a lot that weekend and was able to use the experience to make myself better. Were you nervous at your audition? I was nervous, and nervousness is something everyone deals with. The best way to get rid of your nerves is to gain confidence. If you even think for a second that you don't know something well enough while you are practicing, stop and practice it until you know it. Work to the point that there is no way you are going to mess up. What do you think is most important for someone to take away from the audition experience? The staff members at the camps are not only looking to create a good corps for the summer, they are attempting to teach everyone a little something too. So the best thing to take away is the information the staff is willing to give. It is excellent information. Any other advice? Make friends. Have fun. Shower so you don't stink! Learn more about corps audition dates, locations and additional info.